Love this exhibit by Japanese artist, Yayoi Kusama, at the Hirshhorn Museum. Unfortunately, they were out of passes for this special showing, so I could only grab a quick photo or two. 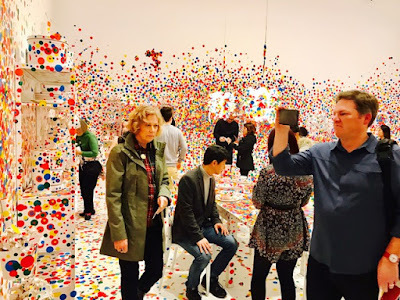 But I was amazed at how splashes of dots and color can make such am amazing impact on a room. Everything in the room--walls, floor, chairs, tables, fixtures, and ornaments--had the design elements on them. The only thing that didn't were the people checking it out and what a contrast that was. It felt like being in the fantasy world of Willie Wonka and The Chocolate Factory or something amazing like that. It is no surprise that people were lining up out the doors for tickets to this exhibit. Is Man An Angel Or Beast?